Did Macbeth have PTSD? Back in the capital, my first pick is a provocative take by sociology professor Anthony King  on one of Shakespeare’s most infamous characters. King’s analysis dissects Macbeth’s actions throughout the ‘Scottish play’ and relates them to his experiences in battle. The New Delhi-based Observer Research Foundation has released a new report on the build-up of military forces (US, Japan, Australia, China and India) and naval diplomacy in the Indian Ocean region . Penned by Rajeswari Rajagopalan and Arka Biswas, the paper is a good introduction to the various strategic interests of the major players in the ocean before turning to the material capabilities including US assets along the African coast and the implications of power shift in the Asia Pacific. Turning to the Persian Gulf, in a new Carnegie Endowment report , Frederic Wehrey and Richard Sokolsky argue that a new forum of Middle East regionalism that includes Iran could potentially lower tensions in the region and complement US interests there. Short on time? Read the summary here . On Northeast Asian dynamics, is South Korea cosying up to its alliance partner the US or leaning back towards China? Writing in Foreign Affairs, Victor Cha argues that Park Guen-Hye’s ‘Diplomacy 2.0’ actually intends to bring the trio closer together. In Cha’s view, her approach is a ‘new form of diplomacy cuts against the grain in Asian diplomacy, where uncontroversial and one-dimensional thinking predominates.’ Keep reading here . The struggle is over in the Indonesian province of Aceh, right? Think again. The indomitable Institute for Policy Analysis of Conflict’s latest report paints a more complex picture there with the continued presence of armed groups . The report focuses on the group Din Minimi, tracing its history and examining the potential for serious violence in the province as a result of the group’s complicated relationship with violent extremists and security forces. An interesting read for Indonesia watchers. Also on violent groups, Mohammed Sinan Siyech provides a quick snapshot of AQAP’s new leader in Yemen  and recent developments in the group’s strength. The week marked the 50th anniversary of the passing of United Nations Security Council Resolution 1325, which highlights the unique experience of women in conflict. Over on Defense One, chief executive of the Institute for Inclusive Security, Evelyn Thornton, examines the way in which women are on the frontline of every battle —but not in the way that you’d think. Lastly, via the Duffelblog , an intelligence officer in the US has lost his job over the misuse of a classified stapler. In this week’s addition to the Foreign Affairs Unedited series , Sebastian Mallaby, Péter Krekó, Tara Zahra, Sebastian Elischer and Patrick Sykes discuss the effects of the global refugee crisis—including its effect on unemployment and economic wellbeing in the EU (21 mins). If you’ve ever wondered about the US’ chemical and biological weapons program, this newly declassified video filmed in 1952  shows the Navy’s ‘offensive biological and chemical warfare’ tactics and capabilities with two specific tests with non-pathogenic agents (14mins). Also for the visually-inclined capability wonks, check out this time lapse footage of the Air Warfare Destroyer being consolidated in Adelaide . 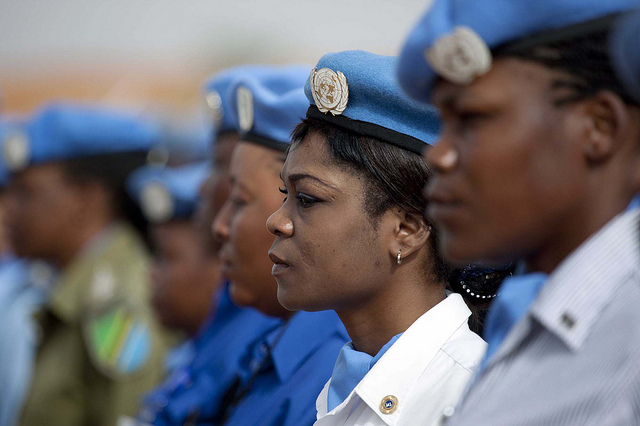 Canberra: Marking the 15th anniversary of UNSCR 1325, the Annual Civil Society Dialogue on Women, Peace and Security 2015 will be held next Thursday 22 October at ANU’s University House from 8.30am featuring an impressive line-up of speakers including journalists, police, scholars, NGO representatives and more (see the full program here ). Details and tickets available here . Should militaries be involved in providing humanitarian assistance during conflict? The ICRC and the ANU’s Centre for Military and Security Law are hosting a debate on this topic on Wednesday 4 November at 6pm with speakers Melissa Conley Tyler, Ned Dobos, William Maley and Mike Kelly. Register for this free event here . Natalie Sambhi is an analyst at ASPI and managing editor of The Strategist. Image courtesy of Flickr user UNAMID.